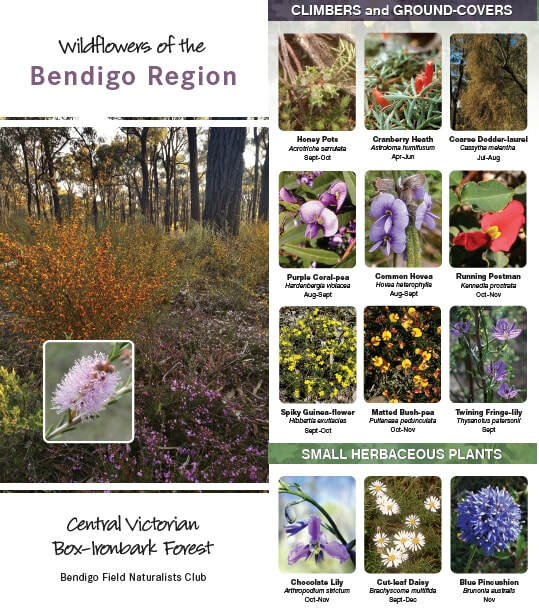 Wildflower Brochure - Bendigo Field Naturalists Club Inc. This new laminated, fold-out brochure is now available. Beautifully illustrated with images of many common and widespread wildflowers of the region's Box-Ironbark forests this is a useful guide for anybody wanting to explore the area and find out more about what they encounter. A detailed map and accompanying text will point you towards the best places to see our delightful wildflowers and forest landscapes. Help support the activities of the group and purchase a copy today for only $3.00.